Glasgow Warriors boosted their Pro12 play-off hopes with a bonus-point victory over Benetton Treviso at Scotstoun Stadium. Two Henry Pyrgos tries and one from Niko Matawalu helped the Warriors into a 19-10 half-time lead, with Alberto Sgarbi crossing for the visitors. 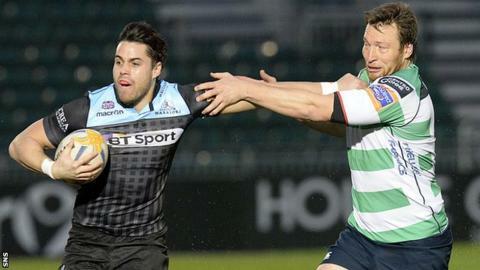 Sean Maitland ran in another score for Glasgow early in the second half. Finn Russell kicked nine points for the hosts while the boot of Tobias Boates gained five for Treviso. Gregor Townsend's Warriors, featuring new prop Geoff Cross for the first time, move above Ospreys into the play-off zone, while Treviso remain second bottom above Zebre. Glasgow got off to the ideal start with Maitland's break leading to Pyrgos's try - the scrum-half's first of the season. Russell missed the conversion. The tempo at which the hosts were playing continued to trouble Treviso in the opening few minutes and Mark Bennett made a long burst before Matawalu sped over. Russell, on this occasion, found his mark. The visitors' start to the match got worse when Marco Fuser sustained an injury and had to be replaced by Marco Filippucci. However, Treviso capitalised on poor Glasgow defensive play to run in a try through Sgarbi. Boates converted. The Warriors re-grouped and their fast-paced approach paid dividends again when Maitland and Rob Harley combined to set up another score for Pyrgos. Russell added the extras. Boates knocked over a penalty for the Italians but the scrum-half pulled his next two attempts wide. Russell extended Glasgow's advantage with a successful penalty kick at the start of the second half. And Maitland got the try his performance deserved moments later, the Scotland back receiving Russell's pass to clinch the bonus point. Russell converted. After such a high-scoring opening hour, the match became quite scrappy in the final quarter and Tyrone Holmes was sin-binned for Glasgow. However, it had no effect on the scoreboard as Townsend's men secured a third straight win. Glasgow Warriors: Murchie, Maitland, Bennett, Russell, Matawalu, Jackson, Pyrgos, Reid, MacArthur, Cross, Swinson, Kellock, Harley, Holmes, Wilson. Replacements: Jones for Maitland (62), Vernon for Bennett (71), Horne for Jackson (59), Nakarawa for Reid (51), Bryce for MacArthur (59), Low for Cross (59), Yanuyanutawa for Kellock (51), Eddie for Harley (62). Sin Bin: Holmes (69). Benetton Treviso: McLean, Pratichetti, Loamanu, Sgarbi, Esposito, Ambrosini, Botes, Muccignat, Ghiraldini, Fernandez-Rouyet, Pavanello, Bernabo, Fuser, Derbyshire, Barbieri. Replacements: Williams for Pratichetti (64), Di Bernardo for Ambrosini (73), De Marchi for Muccignat (43), Maistri for Ghiraldini (60), Cittadini for Fernandez-Rouyet (43), van Zyl for Bernabo (60), Filippucci for Fuser (9). Not Used: Semenzato.